The stamps are underprinted. This means that both sides need to be seen. In a one-page exhibition this is impossible. So the picture of the front of the stamps is actually a second generation scan i.e. I scanned them and then built that scan into the 'main' scan. Thank you for organizing the competition. It was useful to me. I did NOT start on the entry holding the theory I ended with; I began intending to simply produce an illustration to the verses. It was only when I forced myself to do the hard work of translating them that I began to realize what might lie behind them. So I may not have attracted many votes, but I do believe I may have made an original, if small, contribution to the understanding of this issue. Rayb, thank you for putting together a well thought out and very interesting exhibit. I don't collect Montenegro stamps and knew nothng about Nyegos but I do collect WW2 stamps so thanks for showing my how these stamps helped the war effort in southeast Europe. PS - I have never entered an exhibit so I don't feel like I am able to really critique your exhibit. I know what I like and yours was one of the top two that I was impressed with as far as content. I also enjoyed learning something that I wouldn't otherwise ever have become aware of. I can tell just by looking that you planned this exhibit real well and it certainly is original looking. Obviously, you researched you subject intensely. It shows. Well, except for the crowding of the title. It is, I need to say, a bit disjointed. The stamps are amazing and are a great representation of your subject. 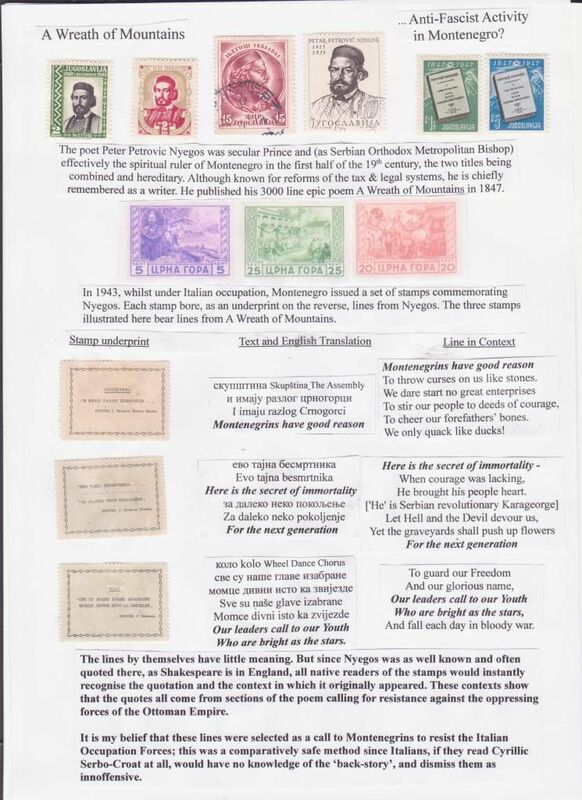 I am very pleased that you are able to show the back of the stamps, even if they are pre-scanned. I gave you high points for the condition and scarcity of the stamps. I am sure there is a lot lost in the translation of the "poem", as you indicate (I think) by not calling the translation a translation but "context". However, and I am not positive about this either, I don't think the actual poem in the native Serbo-Croat language rhymed either. Thusly, I deducted few points for a none rhyming poem in a poem exhibit. But I gave you extra points for trying to use a 300-line poem. You crammed as much information as you possible could on a single page. Bravo. And the information you included taught me something. That really pumps up the points. The "cut 'n paste" aspect of the one page exhibit is kind of distracting with all those shading lines. That is a shame. I had to deduct a few points, but not enough to keep me from voting for your exhibit. I holidayed in Montenegro before the "troubles" in 1990. I still have the Serbo-Croat dictionary! Beautiful scenery..